Gotta go with good ol' Tommy Boy. For my brother, it's gypsy. Gypsy is just the best! Despite "hating" his new voices, gotta give it up for old Servo. While i'm okay with the new voice, kevin murphy is still the best servo. My only complaint about Baron's Servo is that he sounds similar to Jonah. But I was trying to make a bad joke/reference. 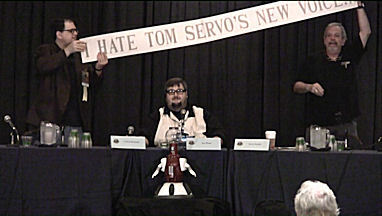 When Kevin Murphy took over a fan sent Best Brains a huge banner printed out on his dot matrix saying "I HATE TOM SERVOS NEW VOICE" which Kevin kept for a longtime. I forgot about that banner. Sometimes i feel like I'm the only one here who's a Josh fanboy. damn it i should have told bob about this when he was online today. why hasn't any one else voted on this. Tough call. Almost tied between Tom and Crow. Ultimately Tom wins for design but Crow would win personality wise. Gypsy comes in third. She looks like she would be a bit more difficult to handle and limited what she could do. Love when they zoom in on her eye like Hal. Season 4 Cambot is my favorites of Cambot. Really need to get the crisper bowls or copies to build this bot. Might make a smaller version until I can do it properly. Honorable mention: The Nanites. I always loved the segments with them in it. season 5.5 cambot was the one made from bowls. Gypsy comes in third. She looks like she would be a bit more difficult photos postées de phenq to handle and limited what she could do. Love when they zoom in on her eye like Hal. For me, Crow is the winner and Tom comes second. Then Gypsy. And yes. we can't forget The Nanites.